For Continuation Music Sheet pages hover the mouse at the bottom of the sheet, to select next page. Now late in the evening Jesus took his place at the table with the twelve and during the meal be said: Jesus: Believe me, one of you is going to betray me, someone who is now having supper with me. Peter: Surely Lord, I am not the one? Paul: Surely Lord, I am not the one? Jesus: It is one of twelve, a man who is dipping his bread into the dish with me. It is true that the son of man will follow the road foretold by the scriptures, but alas for the man though whom he is betrayed. It would be better for that man if he had never been born. Narrator: And Judas, who actually betrayed him said: Judas: Master, am I the one? Narrator: When they sang a hymn together and went out of the city and up onto the Mount of Olives. 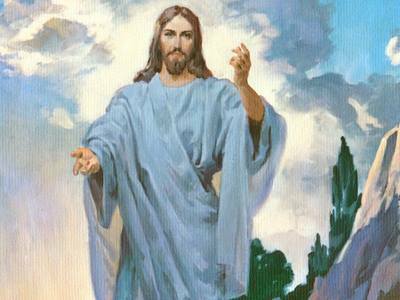 When he reached his usual place he said to them: Jesus: Tonight every one of you will lose his faith in me. For the scriptures says I will smite the shepherd and the sheep of the flock shall be scattered abroad. But after I have risen I shall go before you into Galilee. Narrator: At this, Peter exclaimed: Peter: Even if everyone should lose his faith in you I never will. Narrator: And they all made the same protect. Narrator: Then they arrived at a place called Gethsemane, and Jesus said to his Disciples: Jesus: My heart is breaking. Stay here and pray with me. Narrator: Then he walked on a little way and fell on his face and prayed. Jesus: Dear Father, all things are possible to you. Please let me not have to drink this cup. Yet it is not what I want but what you want. 3 Narrator: And an Angel from heaven appeared, strengthening him. He was in agony and prayed even more intensely so that his sweat was like great drops of blood falling to the ground. Then he got to his feet from his prayer and walking back to his disciples, he found them sleeping through sheer grief. Jesus: Why are you sleeping? You must get up and go on praying that you may not have to face temptation. Narrator: While he is still speaking, Judas, one of the 12 appeared with a great crowd, armed with swords and staves, sent by the chief priest and elders. The traitor himself gives them a sing. Judas: The one I kiss will be the man. Get hold of him and take him away without any trouble. Narrator: Without any hesitation, he walked up to Jesus and said: Judas: Greetings Master. Narrator: And he kissed him. ‘Then the others came up, seized hold of Jesus and held him. Suddenly one of Jesus disciples drew his sword, slashed at the High Priest’s servant and cut off his ear. At this Jesus said to him: Jesus: Put your sword back into its proper place. All those who take the sword, die by the sword. Do you imagine that I could not appeal to my Father and he would at once send more than twelve legions of angels to defend me? Narrator: And then Jesus spoke to the crowds around him. Jesus: So you’re come out with your swords and stave to capture me like a bandit. Day after day I sat in the chapel and you never laid a finger on me, but this is your hour and the power of darkness is yours. Narrator: And at this point all the disciples deserted him and made their escape. And the guards, with their captain and officers, took hold of Jesus and tied is hand together, and led him off to the High priest in whose presence all the chief priests and elders and scribes had assembled. Peter followed him at a safe distance, right up to the High Priests’ courtyard. Meanwhile, the chief priest and the whole council were trying to find some evidence against Jesus which would warrant the death penalty. May perjurers gave evidence against Jesus. One man said, “I heard him say, “I heard him say, I can pull down the Temple of God and rebuild it in three days.” But no witnesses could agree together. Narrator: The High Priest then asked Jesus: Priest: Have you no answer? Narrator: But Jesus was silent. Priest: I command you by the living God to tell us on your oath if you, Christ are you the Son of God. Jesus: I am, yes. And I tell you that i the future you will see the Son of Man sitting at the right hand of power and coming on the clouds of Heaven. Narrator: At this, the High Priest tore his robe off and cried: Priest: That was blasphemy. Where is the need for further witnesses? Look, you’ve heard the blasphemy. What’s your verdict now? Narrator: And they replied, he deserves to die. And they spat him in the face and knocked him about, and some slapped him, crying, Prophesy, you Christ? Even the servant who took him away slapped his face. Narrator: Then the governor’s soldiers took Jesus into the governor’s place and collected the whole guard around him. They twisted thorn twigs into a crown and put it on his head, threw a purple robe around him saying: Soldiers: Hail your majesty, King of the Jews. Narrator: And then slapped him with their open hands and spat on him, and when they had finished their fun, when they had finished their fun, They striped the cloak off again and put his own clothes upon him and led him off for crucifixion having Jesus carry his own cross to a place called Skull Hill (In Hebrew -Golgotha). They offered him a drink of wine mixed with some bitter drug, but when he tasted it he refused to drink it. And when they had nailed him to the cross they shared out his clothes by drawing lots. Then they sat down to keep guard over him, and over his head they put a placard, with the charge against him – This is Jesus, King of the Jews. Narrator: Then from midday until 3:00 a darkness spread over the whole countryside, and Jesus said: Jesus: My God, My God, Why did you forsake me? Narrator: And the veil i the temple sanctuary split in two, the ground shook, rocks split and graves were opened. Then Jesus gave a great cry and said: Jesus: Father I commend my spirit into your hands. Narrator: When the centurion saw what happened he exclaimed reverently: Centurion: That was, indeed, a good man. Narrator: And the whole crowd who had collected for the spectacle, when they saw what had happened, went home in deep distress, and those who had known him, as well as the woman who had followed him from Galilee, remained standing at a distance and saw all this happen. When the evening came, Joseph of Arimathea went to Pilate and asked for the body of Jesus. Pilate was surprised that he should be dead already and he sent for the centurion and asked whether he had been dead long. On hearing the centurions report, he gave Joseph the body of Jesus so Joseph brought a linen winding sheet, took Jesus down and wrapped him in it according to the Jewish custom of preparing a body for burial. In the place where he was crucified there was a garden containing a new tomb in which nobody had yet been laid. Because it was the preparation day and because the tomb was conveniently near, they laid Jesus’ body in this tomb. The last candle is taken off stage resulting in complete darkness signifying Christ’s death. The lighted candle is returned (signifying the rebirth of Christ) and each choir member lights a candle from the last candle.